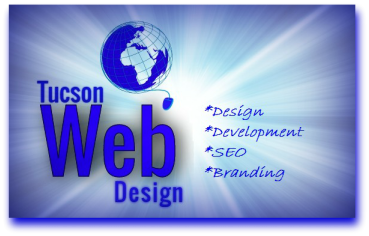 ​View the graphics below to see a small sample of the type of websites Tucson Web Design can create for you. 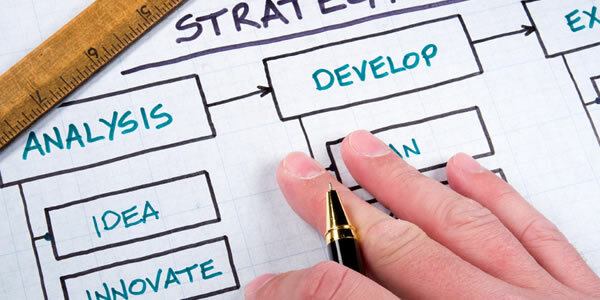 Our website design strategies have helped clients increase sales, add customers, improve brand identity and imaging, and reach top search engine results. We pride ourselves on adapting to our clients' particular business needs. We continue to learn new SEO and design techniques as the years progress so that our clients always have the best options available for their budgets. Attained #1 spot on Google Search for 21 keywords in less than 3 months. 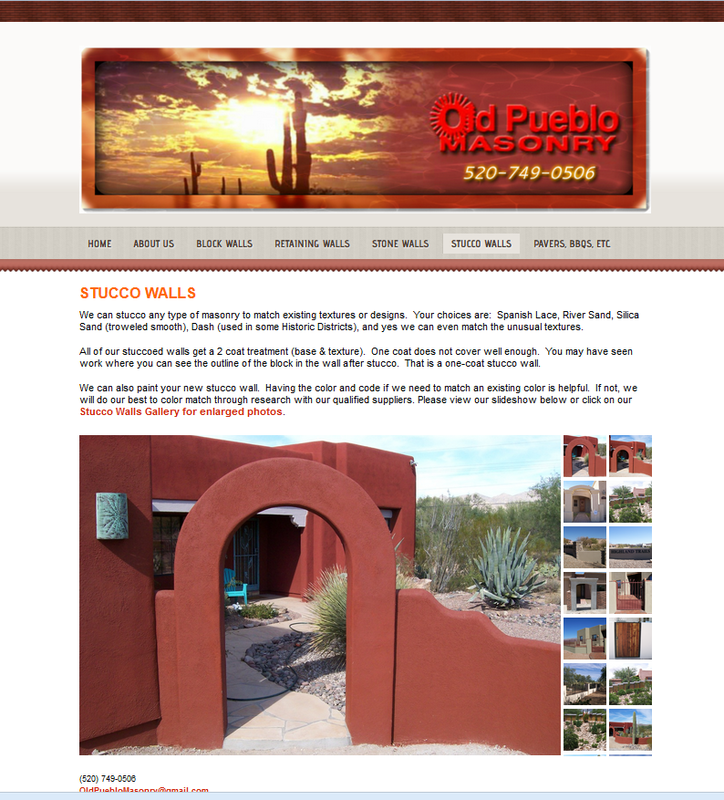 Website contains numerous galleries and extensive slideshows which client needed to showcase their extensive masonry work. Footer contains links throughout, as well as contact information so that every page has the phone number and email of the business. 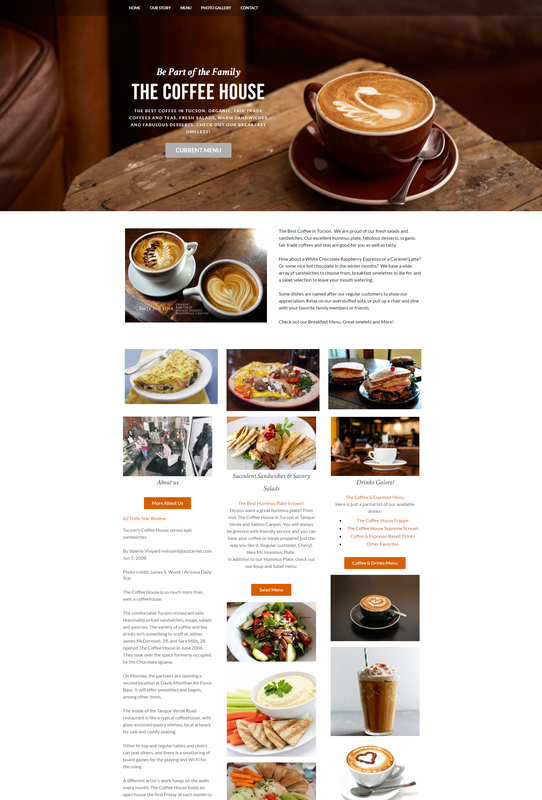 Scroll down to see our slideshow and click here for before redesign and current front page for OPM. Goals: To make the site more visually appealing and easier to navigate, a build that could adapt to their rapid growth, and SEO optimization ongoing to get higher Google Search engine results. The website contains slideshows, a blog, social network integration, easy-to-update calendar, videos, drop down menus and photos throughout. The homepage has a slideshow of yoga images from the actual classes and plenty of links to relevant information about the business. 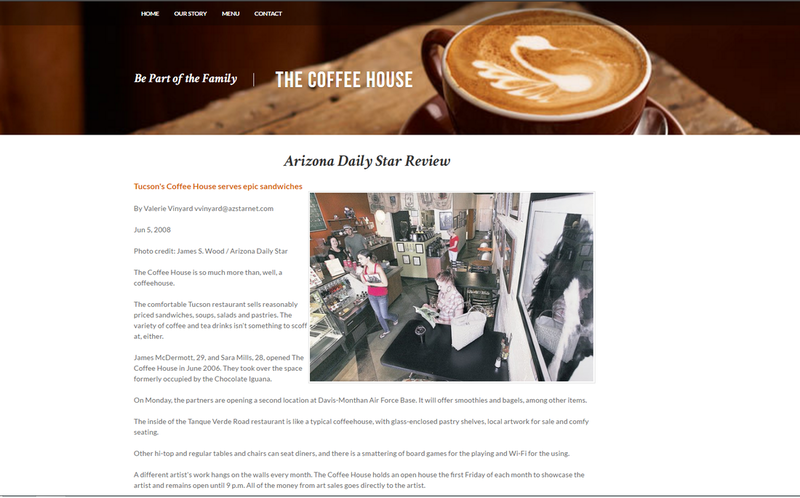 Small family-owned coffee shop on Tucson's east side didn't have a website. They wanted a website that captured their unique offerings, while reflecting their warm and cozy atmosphere. Emphasis was on the menu with the coffee and other drinks, salads, sandwiches, and deserts all featured in the photo gallery and menu. Later, a breakfast menu was added with specialty omelets. The emphasis overall was flavorful drinks and freshly made food. A website designed for personal family use. 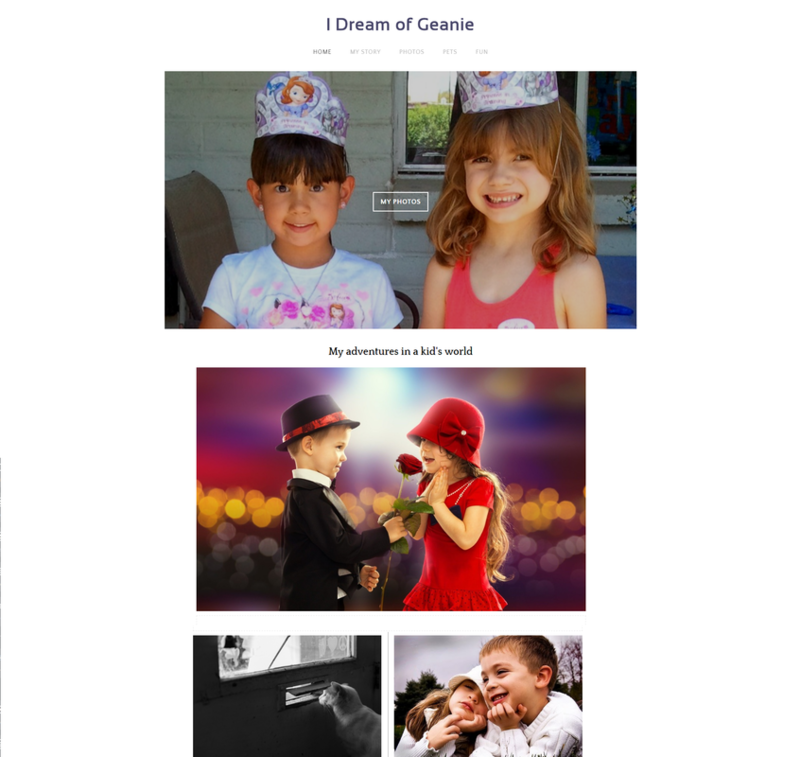 The website is rich on photos and a fun way to get family and friends involved in celebrating a child's life. Both stock photos and actual family photos create a desired theme. Personal website can be an excellent way to archive photos and celebrate milestones both publicly and privately. 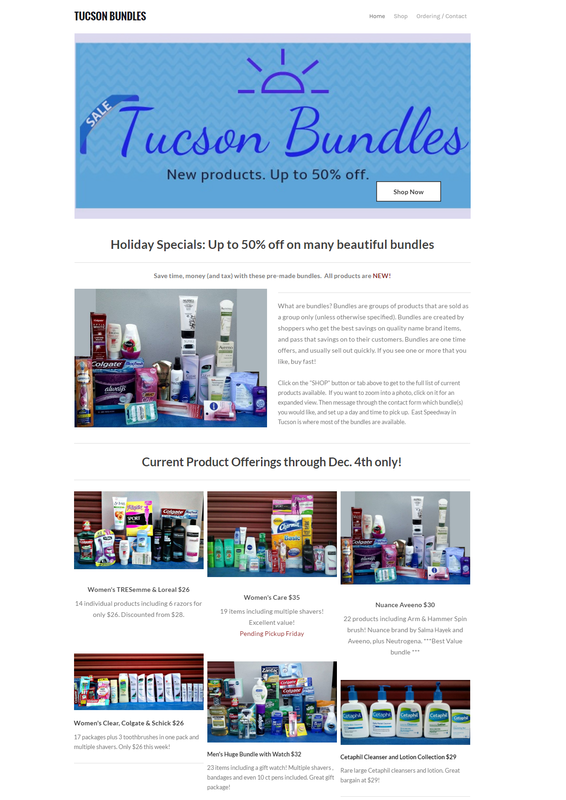 Small business product sales site in simple, clean format with active "shop" button link on homepage banner. Designed December 2016, the site boasts a 95% sales rate in the first month going live! 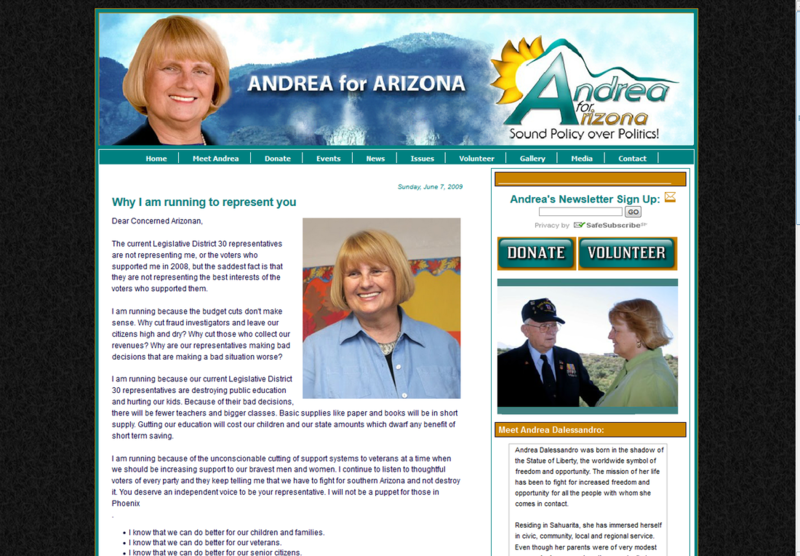 A political candidate (now current state senator) needed a campaign website that included several forms, galleries, social networking, donation acceptance, slideshows and a calendar of ongoing events. ​This site is extensive, with many features and excellent SEO. As an added bonus, the site was built on a platform with free hosting which saved the client hundreds of dollars in hosting fees. 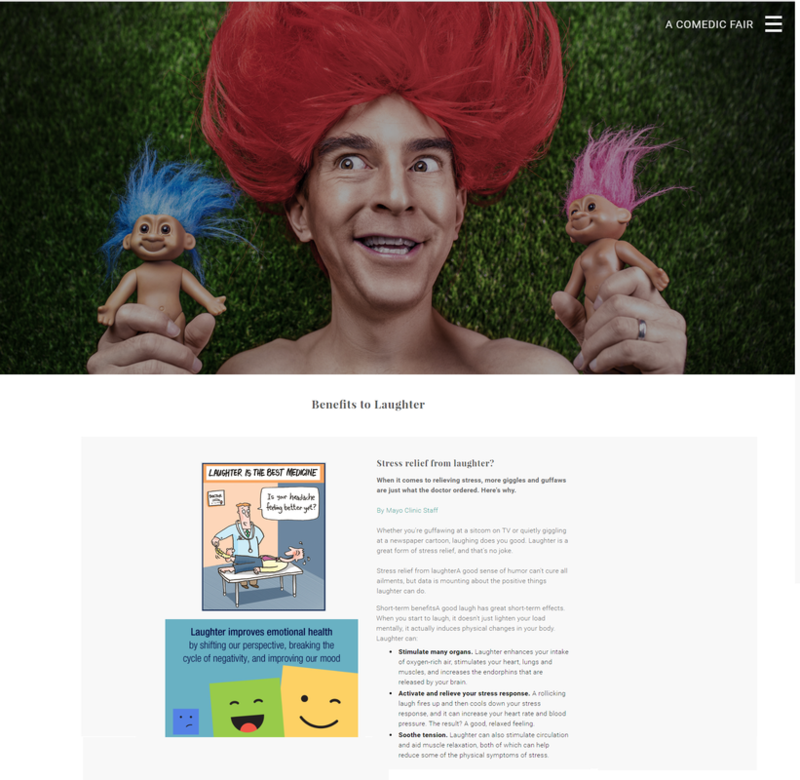 A "character" website that espouses the benefits of laughter in preserving and improving one's health. A simple clean look and mobile optimized. 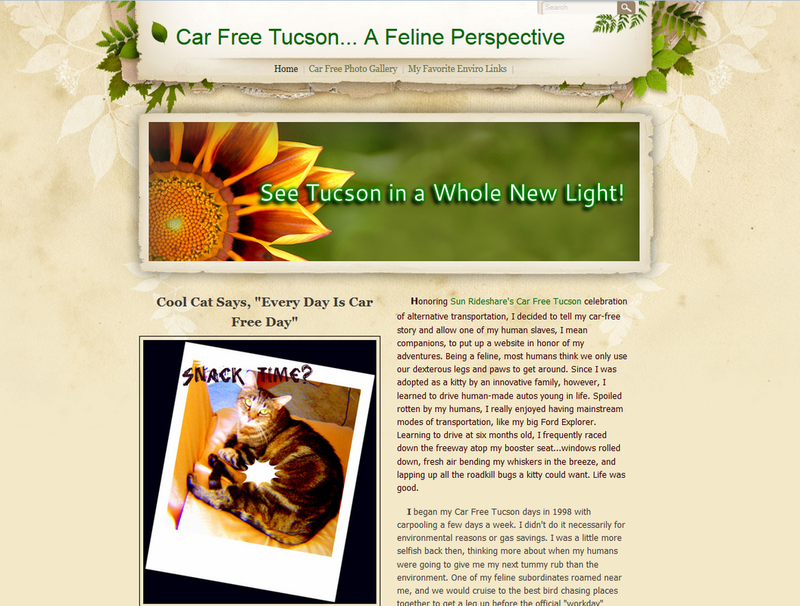 ​This website was built using a new platform for the first time. 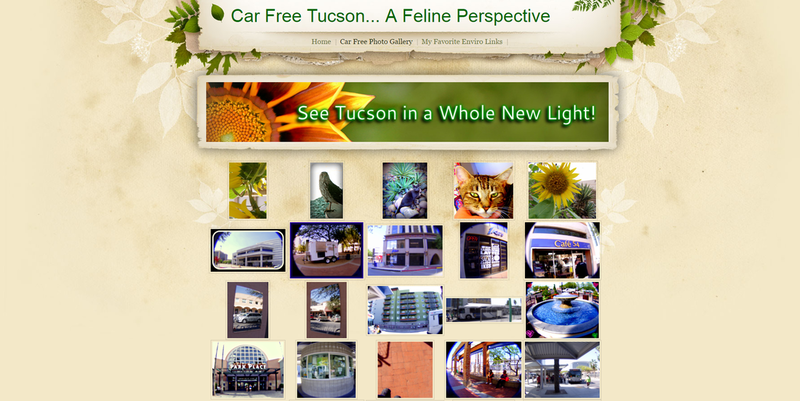 It was created in less than a day and went on to win first prize in creativity for the Car Free Tucson contest. Award winning blog. 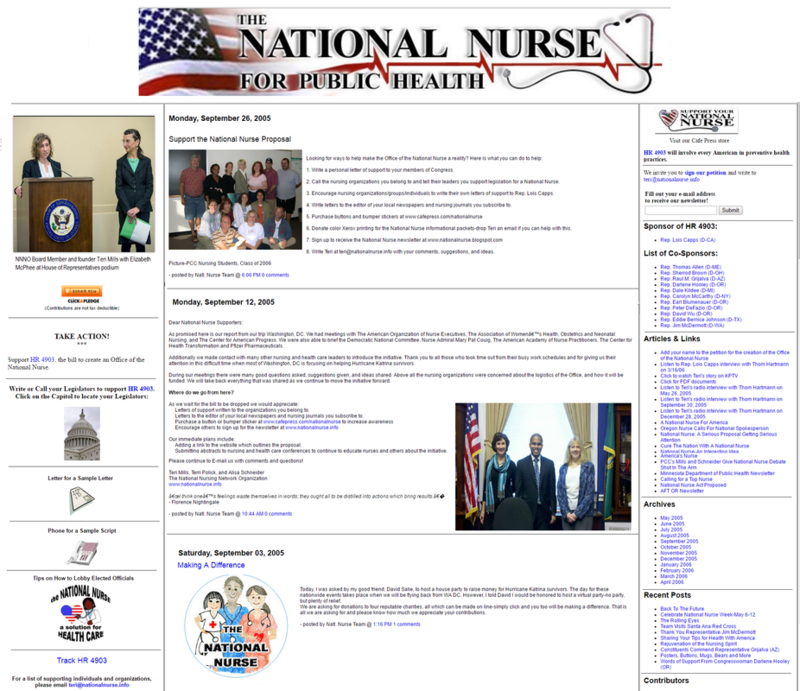 Collaborated with other web and graphic designers to update and redesign a site for a national campaign to create a position for a National Nurse to help oversee healthcare initiatives. Was ranked number three of over 130 blogs in the health category for multiple years in a row. Tucson Homeless Help is an ongoing pro bono project that serves to link Tucson's poorest with resources available to them in the community.